246 pages | 23 B/W Illus. 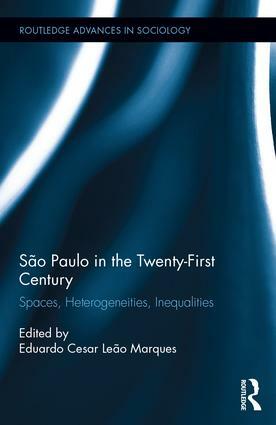 This book analyzes in detail the main social, economic and special transformation of the city of São Paulo. In the last 30 years, São Paulo has become a more heterogeneous and less unequal city. Contrary to some expectations, the recent economic transformations did not produce social polarization, and the localized processes of spaces production (and the plural is increasingly important) are more and more key to define their respective growth patterns, social conditions, forms of housing production, service availability and urban precariousness. In other dimensions, however, inequalities remain present and strong and certain disadvantaged areas have changed little and are still marked by strong social inequalities. The metropolis remains heavily segregated in terms of race and class, in a clear hierarchical structure. The book shows that it is necessary to escape from dual and polarity interpretations. This did not lead to the complete disappearance of a crudely radial and concentric structure (not only due to geographic path dependence), but superposes other elements over it, leading to more complexes and continuous patterns. A general summary of these elements could perhaps be stated as pointing to greater social/spatial heterogeneity, accompanied by smaller, but reconfigured inequalities. 10. Private Sector Housing Developments: Who Produces What, How and Where? Eduardo Cesar Leão Marques is a Livre-docente professor at the Department of Political Science at USP and researcher at the Center for Metropolitan Studies.